Haveil Havalim Edition #138 is up on Soccer Dad's Blog. Please check out the easily navigable edition of this Jewish and Israeli Blog Carnival! The ideal vessel from which to drink tea is porcelain. Ask anyone from Great Britain. Not in the Middle East, though, where one is obligated to burn ones hand on a scorchingly hot glass. Here's a tip. Make sure the glass is not filled all the way. Then encircle the glass with your thumb and forefinger, just under the rim. Drink and enjoy without getting burned. 1. a. 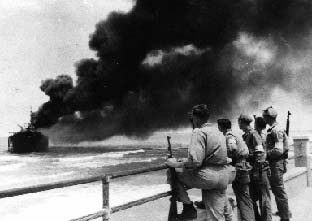 Who ordered the shooting of the Jewish freedom fighters coming toward the Israeli shore on the Altalena? b. Who bragged about the attack on the Altalena while at a reception in Washington, DC? 3. Which evil person was transformed into a martyr, in order to further the anti-Israel, Leftist, post-Zionist agenda of self-destruction? 4. Which former Israeli prime minister was opposed to the formation of another Arab state side by side with Israel? Well, if you answered Yitzhaq Rabin, then you will NOT be allowed initiation into the cult, because your brainwashing has not completed. Before proceeding, you will need to go back for "re-education" in an approved setting, say for example, an Israeli public school. And, no it does NOT matter if it is a religious school or not, as long as it is not "Torani." The Torani schools emphasize the importance of Torah, confusing students with the possibility that the Israeli government is not infallible, and thus have been deemed "unacceptable." Seriously though, and even setting conspiracy theories aside, the creation of the Legend of Rabin is one of the great triumphs of the Israeli government. It has successfully rewritten history under the noises of five million Israeli citizens, as well as the rest of the human population. They have taken a man complicit in murder and have transformed him into a saint. Now, in all fairness to Rabin, rumor has it that before his death, he was actually starting to to see the light, preparing to recant on his policies destructive to Israel. Assuming that was true, it was most likely because actually realized that in order to get re-elected he might have to listen and to implement the will of his constituents. Israeli public schools put on elaborate assemblies to commemorate the anniversary of Rabin's death. The entire day is spent on discussing Rabin's "vision of peace," via the gradual destruction of the State of Israel and Jewish identity of Israeli citizens. Children discuss how [even though the Arabs have never kept a single peace agreement] the next time a peace agreement is signed with the Arabs, they will surely honor it, and the killing will stop. Israelis are to take the higher ground, demonstrated by their continual willingness to make concessions and to tolerate the deaths of its citizens,...all for the sake of peace. This year the number of activities, such as religious and right-wing bashing were reduced. Striking high school teachers refused to return to work, despite calls by Minister of Education Yuli Tamir for a one-day suspension in honor of Rabin's anniversary of death. Eight years ago, as a junior high school teacher, I had the displeasure of being forced to attend a ceremony in Rabin's in honor. At this ceremony, I had to listen to a "rabbi" had the hutzpah (gaul) not only to praise Yitzhaq Rabin, but to use his name in the same sentence with Rahel Immeinu, whose anniversary of death is the day before his. This "rabbi" did not stop there, but made comparisons between the two. And this was in Beth-El, a town where an entire neighbor of residents was prevented from entering their already finished apartments, due to Israel's concession of a housing freeze. Fortunately, and I am not at liberty to reveal the details even now, the apartment owners were able to bypass the guarded fence, and enter their apartments on a Thursday. Why Thursday? It was almost the weekend. By Sunday they had lived in their apartments for three days, which under Israeli law gave them limited squatters' rights. They had fought fire with fire, and the government was powerless to evict them. If only that were the case today. But, nowadays double standards are the norm of the Israeli judicial system. The commemoration was interrupted periodically by "Second Intifada" shooting in next door Ramallah. In fact, can you imagine what it was like to teach with refular shooting in the background. The student who lived around the corner in Dolev and Talmon were found space in the high school dormitories, so they would not have to face daily dodgings of bullets, nor the increase in two hours to the commute. For a while, anyone leaving Beth-El was not allowed to do so without waiting for the IDF escorted caravan. Current President Shimon Peres probably would have reassured us that those were not the guns that we gave them. They were obviously different guns. One of my fellow teachers brought a sefer to study, an early example of "refusing orders." Instead of standing attentively, he made a point of learning, explaining to his students that the ceremony was nothing less than Bitul Torah. Those eighth-graders of ours are now in the army. Let's hope that our examples are remembered when they are faced with the decision whether to follow or to refuse orders which are contrary to Torah law. A few years later, at a different school, I encountered a preferable approach. The elementary school where I then taught made the requisite Rabin memorial display, and set it up in a visible, yet clearly non-prominent corner. I do not recall any memorials at that school. If there were, then they were not memorable. Recently it has also become customary to fast on the anniversary of Rabin's death, actually having the hutzpah to place this observance on the same level with the Fast of Gedaliah (I wonder just how many Rabin Cult members actually fast on the Fast of Gedaliah.) Cult clergy have also ruled that weddings are not to be performed on this day. However, weddings on Shabbath and marriages to non-Jews appear to be acceptable within cult guidelines. I am really NOT kidding about this. Please click to see the report on the Israeli news site YNET. 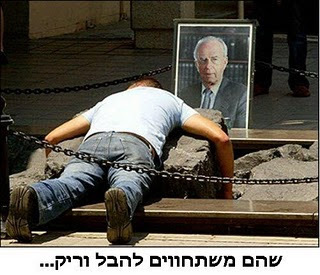 Those who are truly righteous adherers to the cult, perform full prostration in front of Rabin's image, and preferably at the site of his death next to Tel-Aviv City Hall. Even after my extensive research into the Cult Of Rabin, I still have one question: How do they get away with commemorating his Rabin's death both on the Hebrew date and on the non-Jewish date? My hypothesis is that the cult masters are transitioning their followers from Judaism to pure cult worship, realizing that these things take time. Sometime soon, I expect that the 12 Heshwan date will be phased out in favor of a singular day with pomp and ceremony on 4 November date, albeit more pomp than ceremony. On that day, the surviving version of Rabin's "vision of peace" will have achieved its fulfillment: A de-Judaification of the Jewish People and de-Jewification of the Land of Israel. The former Jewish People will now be able to take its rightful place, fully assimilated into European society, following the new heirs to the throne, Yossi Beilinand Avraham Burg, waving our EU passports in joyful unison, with our new "bottle top" shaped kippot blowing away in the wind or tucked away in our pockets, our fifth exile having begun right under our noses. May God forbid it. May God save us. Additional commentary can be found at the Israeli Satire Laboratory. It may be "satire," but it is really not so far away from the developing reality. Also, special thanks go to A Simple Jew for leading me to the Altalena article linked above. Usually when you hear the word "drive by" shooting, you think of Los Angeles gangs. Well, today there was a "drive by" in my 'hood, near Shkhem (often identified as Nablus by the international news media). The shooting took place at the northern entrance to Ariel, a city in Samaria which site midway between Tel-Aviv and the the Jordanian border. In order to catch the shooter, the road was blocked between Ariel and Tapu'ah Junction. I knew that there was no way that the bus was going to get through, and most likely had already decided to skip my bus stop. So I did something which many of you may is crazy. I started walking south,...unarmed. My goal was to get out of the mess, and get to the next town, Rehelim, where the main highway is joined by road from Ariel's southern entrance. Once there, it would be possible for me to catch a ride toward Jerusalem. I have walked this road before, and was not concerned. I was joined by a former student. We exchanged news about Havath Gil'ad, where he was headed to help defend its residents from the continual plague of Arab harassment and by the self-hating Jews who come along to egg the Arabs on. The Israeli government is supposed to call that kind of activity "incitement," but doesn't because religious Jews are not involved. Shortly before we reached Rehelim, we could tell that the roadblock had been lifted, by the renewed flow of traffic. I later learned that the terrorists had still not been caught. Various organizations like the UN, EU, and any number of NGO's constantly criticize Israel for the "great hardship" it causes the Arabs through the roadblocks it sets up in Judea and Samaria. Well, this is why. The roadblocks are set up to prevent such attacks, by hindering the movement of arms and of the terrorists themselves. Critics have also come down on the IDF for the searching of ambulances, even though incidents of ambulances smuggling arms are well-documented. It is clear that the so-called "international community" cares more about the occasional inconvenience to Arabs' than actual Jewish lives. I wish that fact were clear to my Jewish brothers and sisters in the U. S. and elsewhere. Meanwhile, just where did the Arabs get their weapons from? A certain former, Israeli prime minister authorized the arming of the Arabs about 13 years ago. Funny. I don't feel very reassured. There was just a "drive by" in my 'hood. Since the system of roadblocks is not 100 percent effective. So there really is only one solution... But we are not allowed to talk about it. For if we do, we are accused of "incitement." Here is the link to the Aharon Deutch's Israel National Television interview with Yekutiel Ben-Ya'akov. Ben-Ya'akov is a resident of K'far Tapu'ah, and one of many Jews served with "stay away" orders from their homes in Judea and Samaria. He is the founder and head of Yeshivat Magen Ha'Aretz on a hilltop near K'far Tapu'ah, where men study Torah, as well as self-defense and dog-handing. The dogs are employed in guarding towns, search and rescue, and bomb detection, and are responsible for the saving of many lives. The "authorities" claim that this is a preventative measure to protect the Arabs from possible harm while they are harvesting olives, often within close proximity to Jewish towns. Jews are served with restraining orders, preventing them from going to work, and if their families come with them, it makes it almost impossible for their children to attend their schools of residents, their wives to travel to their workplaces, and for them to protect their homes from Arab infiltration. Of course, the thought of serving restraining orders to Arabs when their is a clear and present danger to Jews seems to be out of the question, and evn thought of it can cause a Jew to be investigated for "incitement of racism." (IsraelNN.com) In addition to a new regulation banning denim jeans in the Knesset building, sandals - the classic Israeli footwear - have now been banned as well. Journalists and citizens invited to testify before Knesset committees bitterly complained Monday that they had only been informed of the jeans ban and not that on sandals. Exemptions were granted after committee heads called the head of Knesset security to ask that entry be granted to the sandal-footed visitors. Well, I'm glad, someone showed some sense. Apparently, the durability of denim is ideal for those wearing leg braces. Other fabrics would not last very long, with the constant rubbing of the braces. Back to the issue at hand, those of you who know me, know that I do not own standard shoes, and haven't owned shoes in years. I have two pairs of sandals, one for during the week, and one for Shabbath and Yom Tov (shown right). I even polish them liKhvod Shabbath Qodesh. Most inclement weather does not deter my sandal-wearing either. Last year I continued in the tradition of my Macho Settler Sandal Shitah, wearing sandals throughout the winter, with the exception of the week of Jerusalem snow, and periodic days of heavy downpour. On those days, I must admit that I did wear rain boots. Where are the Israel sandal companies? Why aren't they crying "foul?" Israeli cultural pride aside, what about the possible financial implications? If the U. S. Congress were to ban sports trainers, there is no doubt that athletic shoe companies and civil rights groups would cause such an uproar, the ban would be reversed before day's end. Cries of freedom of expression would no doubt be accompanied by the proclamation that trainers have a firm place in American culture, and are now considered part of traditional American dress. Furthermore, where are all of the groups who traditionally call for unity among Israelis? Is this not an issue affecting religious and secular, right and left, Jew and Arab? Have they caved into their Euro-philia, shunning their traditional footwear for one more acceptable to the West? Forget the Annapolis Conference! This issue of the Kenesset's ban on sandals has the real potential to bring down the current government. And so, I put it out to you, my fellow Israelis. Let us not be stepped upon (pun intended)! Let us rise up, and take action! ...In the meantime, the next time I visit the Kenesset on official business, I suppose I could just take my sandals off. After all, I saw nothing in the ban regarding bare feet. One of the big responsibilities I find hosting Haveil Havalim is my perceived necessity to compose some fabulous and unforgettable introduction. 2) ...I began trying to search for hidden meanings in the number 137. The first thought which popped into my mind was Psalm 137, recalling it to be highly politically incorrect. I will leave you to ponder the possible meanings behind those two statements taken out of context from the introduction I wrote, and then quickly erased, believing it to be worthy only of deletion. *Update: Thanks to Soccer Dad, and now have something significant to mention regarding Psalm 137, and thus the number 137. I was so focused on being politically-incorrect, that I completely spaced out on the true significance of this psalm for today. Like I was going to say before (but deleted prematurely), spiritual meanings are revealed when they are supposed to be revealed, and not a second beforehand! As you scroll down to the News section, I think you will be with me in understanding the significance of these p'suqim (verses). I now present Haveil Havalim Blog Carnival, Edition 137. Elie's Expositions opens this week's Carnival with a D'var Torah from last week's Parshath HaShavu'a, No'ah, in Half Lives. Yitz at Heicahl HaNegina presents a collection of pieces in Let It Rain, Let It Pour! Avrohom brings us his Daf Notes on the Babylonian Talmud: Kethubboth 48: Husband Imposing Stringencies on his Wife and 49: Supporting Your Children. Dixie Yid shares a nice story from the Alter of Slabodka ztz"l which suggests that where you are headed is more important than where you are, in Which Way Is Up? In a similar post, helpful lessons can be learned from Akiva at Mystical Paths in Out Of Sync. Rivkah Lambert Adler shares an overview of her studies of Rav Avraham Yitzhaq HaKohen Kook ztz"l, elaborating on how the Jewish soul is interwoven with the Land of Israel. Conservative-Liberal Eric-Odessit gives us a compelling, and perhaps not so well-known, story in Jewish history with Two Flags: The untold story of the Warsaw Ghetto Uprising and its relevance today. The power of the Jewish spirit is also revealed in Soccer Dad's review of the Dreyfus Affair, in light of the Dreyfus Exhibit currently on display at the Yeshivah University Museum. Mother In Israel at the Shalom Bayit blog brings us the story of a family challenge in One Woman's Story. An unfortunately true challenge to us as a nation is revealed by Rafi at Life In Israel in Destruction Of Rabbanut is Almost Complete. This has been reported on and hinted to in the news here in Israel over a long period of time. But, I place it here, as rabbis serve as the spiritual, as well as religious guides to many of us. It also bridges this section with the news section. There has been a lot of chatter lately about the Israeli soldiers being held captive, Ron Arad, who has been held for 21 years (13 Tishrei/October 16) in Lebanon, and Gilad Shalit in Azza. Tom Gross at NRO reports on where Ehud Goldwasser and Eldad Regev may now be, after they were captured last summer by Hizbollah YSh"W.
Avi at Tel-Chai Nation is one of those bloggers who keeps his ear to the ground, keeping us all up to date on current events in Israel. This week he says, I think it should be obvious by now that Avigdor Liebermen is worthless. I have learned that Avi does not make such statements lightly. So I suggest you check out this post, and find out why he thinks this. Avi also brings us a report on the Three Criminal Probes into activities of the Israeli prime minister. Whether one agrees or not with the intentions of U. S. Secretary of State Rice, Carl at Israel Matzav provides us with Condi Rice's Extraordinarily Bad Day, which even evokes some sympathy from me, in her attempts at dealing with the knuckleheads in the Israeli government, including the Delusional Prime Minister. But, Carl's eye-opening Rice's Puppet Government immediately quashes that sympathy, as it appears she is able to exercise quite a bit of control over them after all. Speaking of the Israeli Government, do we yet know what was bombed in Syria? Snoopy The Goon at Simply Jews gives us the latest report in Syrian Officials Admit Site Attacked. Batya at Shiloh Musings tells us about a radio interview she gave regarding the concessions currently up for discussion in It's Not About Shiloh. Then closer to home, gives us a first-hand report on this week's teachers' demonstration in Tel-Aviv in Another Amona?, as well as What Israeli Teachers Want. West Bank Mama honestly states that she does not know what the solution is during this season, yet acknowledges that we must remain On Our Guard. Ezra HaLevi at the Kumah Blog reports on one possible solution, and the recent uproar it seems to have been causing in Avoda Ivrit Roundup. One by A Town Crier and one by Debbie Schlussel. One by Carl and one by Schvach Yid. Although any parallels suggested between ANNapolis and Oslo cannot go without mentioning, like in Dream Team by The Hasmonean. The truth s that I really have to say Kol HaKavod to those who took the time to write about this issue, including Marty Peretz at The Spine who reminds us of some important historical background in The One Reality In Annapolis. Now, what's all this I hear about the creation of yet another Arab state??!! Well, Yid With Lid has the Perfect Solution to the [so-called] Jerusalem Issue. Not far behind is Snoopy The Goon at Simply Jews with U. S. Wants Palestinian State Now. Yisrael at My Right Word provides some background to Arab claims to the Kotel (Western Wall) in Why 1930 is Relevant to the Temple Mount Issue in 2007, with Elder Of Zion adding his commentary in The British and the Wall. Meanwhile, Yid With Lid lets us know about Aliyah of 7,000 B'nei Menashe Not Allowed. Now it's down to Virginia where Boker Tov, Boulder provides news of sanity amongst the insanity by introducing us to Rep. Eric Cantor fighting against Temple Mount Destruction. News media sources are of great concern when it comes to Israel. ShrinkWrapped asks the question about MSM Bias and Pallywood: Incompetence or Malice? The Ongoing War Blog presents another story which received only very limited media coverage, Voting with Their Mortars and with Their Feet. Jules Crittenden gives us a glimpse into Hamas YSh"W television in Rage! Rage! Rage! Although I agree with The Hasmonean's post CNN’s Stature in Israel Approaches Irrelevant, I am surprised that Israelis are finally waking up. I guess that a private company like HOT has more leeway in the independent thinking department. But, still, were they, and the Jerusalem Post blind to the CNN bumper stickers I was already seeing in Jerusalem years ago? Fortunately, we bloggers are quite to fill any media void with our commentary. Zionist Youngster's blog Our Children are Our Guarantors is one I would like to take the opportunity to recommend that you check out for commentary. First of all, in order to experience an Israeli "slice of life," you have to come Israel. Batya, one of Arutz 7's featured bloggers tells you in galuth Come On! Lech, Go! I'm Talking Lecha, To You! Yet, in getting here, AmEchad expresses concern over the Nefesh b'Nefesh organization. Sukkot in the Old City from The Streets Of Jerusalem blog. Batya shares photos of her first grandson in Night Before the Brit Milah and Yochai Aryeh's Brit Milah. A Mother In Israel shares her personal, and heart-felt experience In Which her Son Gets Kicked Out of Yeshivah. Meanwhile, another one of her children adjusts to first grade in Shalom Kitah Alef. One of the kinds of "slice of life" stories in Israel I can never get enough of is about "tremping" (hitchhiking). What it illegal in the U. S., is actually a necessity for many of us here in Israel. I have bumped into some of the most interesting people tremping. But, I have also had some of my most difficult experiences in Israel tremping. Here's one from Batya at Me-Ander. One fun and fantastically descriptive slice of life blog from Israel is Doodle Head's. Doodle Head is a yeshiva student from the U. S. in his second year in Jerusalem. Not only does he manage to keep up with his learning, he seems to be making the most of is Israel experience, hiking the full length of Israel, spending Shabbatot in cities and towns across the country, and learning about the various causes in which residents are active. Get a first0hand account of a student's life in Israel from Doodle Head. I will end this section with another mazal tov post, because I believe that's what life is all about, improving ourselves and improving the world, and then handing off to the next generation what we have learned, and what we have done, and let them take over. Now, please say hello to the latest addition to fellow blogger Rafi G's family. Mazal Tov! Dixie Yid provides us with photos and a video of Rav Tzvi Mayer Zilberberg's Visit to his schul in Woodmere, NY. A Simple Jew shares how his family said goodbye to the television in American Idol Banished. And, even though I am not from New York, I could relate to Maya saying Good Bye, Great Lawn. This news item Diversity? by Ocean Guy, actually seems to have started out as a "slice of life" item. How many of you have ever brought a souvenir back from vacation for a friend? Life for the Jews in the U. S. can be a struggle as the Jewish Blogmeister shows us in Chabad House in Trenton Under Fire. This is also true for the Jews Being Set Up in Turkey, as revealed by Mr. Bagel Blogger. Mottel at Letters Of Thought gives us a photo essay The Industry of Wine. I am not sure where this is. I assume it is outside of Israel, as I know that Mottel would have called me, if he were in the country. Finishing up the Slices Of Life Sections, I want to make mention of two bloggers whom most of you already know. They did not submit anything this week. But, if you are interested in the goings on in the lives of two Jewish students, check out Irina's The Ignoble Experiment and Tnspr569's How To Measure The Years. Yitzhak of Judeopundit suggests we re-examine our respective diets in Potato Kugel Greater Threat Than Global Warming. From an alternative perspective, Rafi from Life In Israel brings us Two Health Segulahs. From an increasingly mainstream perspective, Frumstepper gives us her take on how Humility Is Not Humiliation. Here's a blog which may be new to you, so I will honor it with a place in its own section. Visit David the Hebrew Language Detective to find out the etymology of the Hebrew word Eqdah. Pillage Idiot eve-drops on a conversation between U. S. presidential hopeful Ron Paul and his cocker spaniel. I don't really see how this is related to being Jewish nor Israel, but that last time I checked herring is kosher,...if that makes any sense. We can always count on the Israeli Satire Laboratory to come up with something Israel-related to tickle our funny bones, yet, at the same time call attention to important issues. Check out It's News! It's Satire! No, It's the Palestinians - Claiming The Western Wall!, a lighter side to the news story mentioned above. 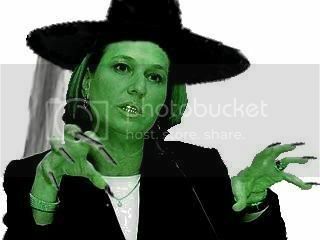 Rafael brings us this most excellent photo of Israeli Foreign Minister Tzipi Livni's "true color:" HA! HA! HA! I'll get you my little settler! Special thanks to Soccer Dad for helping me to scour the Internet for interesting posts, and to Mechon Mamre for its free, on-line library which includes Torah, Nevi'im, Kethuvim, Mishnah, Jerusalem and Babylonian Talmuds, the Ramba"m's Mishnah Torah, and more! ...and the JPix Blog Carnival hosted by Baleboosteh. Please send your posts for next week's edition of the Haveil Havalim Blog Carnival via the Blog Carnival Submission Form. I found this to be very helpful in organizing your posts this week. Plus, it doesn't look like we have a host for next week, so there wouldn't be any other place to send your links to. If you're interested in hosting please contact Soccer Dad at dhgerstman at hotmail dot com. Yekutiel Ben Ya'akov (Mike Guzofsky) has received an expulsion order from K'far Tapu'ah where he resides and runs a security canine program and yeshiva on the K'far Tapu'ah Hilltop. Ben Ya'akov is forbidden from entering anywhere in Judea and Samaria, excluding Maleh Adumim until the end of December. The edict was signed by General Gadi Shamni the Chief of all troops in Judea and Samaria, and who is empowered by the military authority that governs the "territories" to exile Jews and to execute other emergency administrative orders for "state security purposes." Ben Ya'akov recently submitted his candidacy in the municipal elections of Kfar K'far Tapu'ah. The military order that expels him from K'far Tapu'ah is clearly interfering with the democratic political process and will make it difficult for him to campaign and seek election. Nerya Ofan of Yitzhar also received a similar expulsion order. Ben Ya'akov and Ofan's official response will be released shortly. Two nights ago, as reported by Nissan Ratzlav-Katz of Arutz 7, administrative restraining orders were issued for several Jews in Samaria, including Yitzhar resident and Mishmar HaMiqdash (Temple Guard) Neriah Ofan. They are not allowed in Judea nor Samaria through the end of December, the duration of the "Masiq" (olive harvest). The "authorities" claim this action is to prevent any potential conflicts from occurring between Arabs picking olives and local Jewish residents. Apparently the thought never entered their heads to serve the Arabs, who do not have any valid documentation supporting claims to land and olive groves, with the restraining orders. This year that includes Hanukkah. These men will not be allowed to spend Hanukkah with their families in their own homes, in their own communities. One of those served with an administrative restraining order is my friend and neighbor, Yekutiel Ben-Ya'akov. This time last year, Neriah Ofan (2nd row, 2nd from right), Honenu's Ariel Gruner (1st row, 1st on the right), my friend, Gil'ad Pollack (top, left corner) from Havath Ma'on who was newly married at the time, my neighbor Yehudah Goldberg (2nd row, middle), and at least 16 other Jews, residents of were summarily expelled from their homes in Judea and Samaria with the same lame reasoning. Notice the physical appearance of these Jews: beards, large kippoth, and most with payoth (side locks). Outward appearance isn't everything, of course. But, taking pride by visibly differentiating ourselves from non-Jews has long been criticized and even discouraged by the secular, Euro-phile left and by the left-wing of the State-worshipping mamlakhtim, who live to harass those of their brethren who carry most of the remaining passion to possess and to work our homeland, recently returened to us. They do so in spite of the self-haters who would destory it. 19-year-old Elad Keller (bottom, right corner) from Havath Ma'on in Judea was also one of the expellees. One of the reasons he defied last year's order was a practical one. He did not have the money to pay rent in Jerusalem, the least inconvenient city where he could reside for the ordered two months expulsion. He requested that the government pay his rent. The government refused his request. Gen. Ya'ir Naveh signed last year's expulsion orders,...a kippah-wearing general! He was later called before the re-instituted Sanhedrin to answer questions regarding his actions. Gen. Ya'ir Naveh never accepted the invitation to appear, apparently choosing the sanctity of the State over the sanctity of Torah. This year's expulsion orders were signed by Gen. Gadi Shamni. Perhaps he will not have the same choice to face. Although, we have seen that the presence of a religious article such as a kippah has become not only ever shrinking is in size, but increasingly meaningless amongst the ranks and other prominent officials, as well. Meanwhile, leftists continue to do whatever they want, without any limits, and without any shame, like harassing the residents of Havath Gilad, purchased from Arab claimants to the land, years ago, as if that matters to anyone. Haveil Havalim Blog Carnival #136 is up at HH Founder Soccer Dad's. I'm on deck for #137. Please send me your submissions via the handy-dandy, Blog Carnival submission form, by clicking here. A week ago, NRG, the Israeli daily Ma'ariv's on-line edition, reported that fall is indeed just around the corner, due to the reappearance of Krembos (Hebrew). A Chocolate-covered marshmallow wafer is a confection known under different names in different countries. The HUTZPAH! Lumping Krembos together with the less than adequate substitutes from other countries! Anyway, one of Krembos' crucial functions is that they serve as an Israeli ice cream substitute during the colder months of the year. Starting around now, ice cream starts to dwindle, and eventually becomes almost impossible to find until next spring. Why this phenomenal change-over occurs in Israel, I have no idea. Much of the country just does not get THAT cold to warrant the absence of ice cream. I suppose that there are just not enough winter ice cream-eaters to justify winter ice cream production. So, pass the Krembos, please. OK. So, I wasn't exactly "tagged" for this meme. In fact, I wasn't "tagged" at all. "Ya'aqov, really! If you have time to sit around, surf the Internet, and actually push your way into silly and annoying, little blogger games, then you REALLY need to get a life!" Add a direct link to the post below the name of the person who tagged you. Include city/state and country that you're in. List out your top 5 favorite places to eat at your location. I'm going to stick with Jacob's lead on this, and list "...my top five favorite places to get food from, not necessarily restaurants." I don't think I going to stick with just five, either. Oh, and, I'm not going to limit myself to one tiny location which is closer to Jordan than the Mediterranean Sea, either. Although most of my entries come from Jerusalem. Oh, yeah, and I'm going to categorize the entries. Hey, I stole it, right? I can play this however I want. I am not going to tag anyone either. If you are interested in participating by listing your own favorites, and/or debating mine, make sure to leave a comment and link on this post. And, of course, in the self-promotional spirit of the Blogosphere, please DO link back to this post. (wink, grin) So far, only Batya has taken up the challenge. Let's face it. There's just no such thing as "good pizza in Israel." It's all about the crust. [Native-born] Israelis just don't seem to know how make good pizza crust, unless it's by accident. I heard a rumor that one place actually DID make good crust, but since "Israelis" didn't like it, he had to stop making it. Anyway, the least worst pizza in Israel comes from Big Apple Pizza (Jerusalem Rabbanut - Mehadrin) in the Center of town, Jerusalem, and Pizza Shai in Beis Yisroel (Eidah Haredis). Sure, people rave about Dr. Pizza (Rav Rubin), Bar Ilan Pizza (Eidah Haredis) and Pepperolli's (Eidah Haredis). I've had them all, and they are all OK. But, my votes for the above stand. In all fairness, people used to rave about Pizza Larry, near Har Nof, which I've never tried. But, I believe it has moved. BY FAR, THE best shawarmah I've had in Israel has been from HaShawarmah (Rav Rubin) in the Shmu'el HaNavi neighborhood,...sort of. It's actually up on Golda Meir St., on the left before the Angels bakery. Both the turkey and the beef are good. I'm afraid I forgot if they have mutton, but if they do, then that's good, too. Their secret (not anymore) is that they don't over roast it. They then finish the cooking on the grill, according to order. It comes out very juicy this way. The best Yemenite restaurant could be found on the ground floor of the Tel-Aviv Central Bus Station. Don't laugh! If you look hard enough, you too, can find a treasure or two in this underrated bastion bargains. Unfortunately, the restaurant called HaTemani disappeared a couple of years ago. I may has found it again on Rothschild St. It has the same name, but I'll have to check if it is the same place. An old standard for reasonably-priced, good Yemenite food is, of course, HaMervad HaQsamim (The Magic Carpet) on King George St. in Jerusalem. OK. So, to be fair, I had better list the best traditional Ashkinazi food available. That would be Moshe Leiberbaum's (Eidah Haredis) on Shtrauss on the way to Kikar Shabbos in Jerusalem. I cannot recall this restaurant's real name. Everyone just calls it by the owner's name. All your favorites can be found here: Roast chicken, stuffed peppers, potato kugel, and [not necessarily] Ashkinazi salads. Try Moshe's chopped liver! This is a great place to go for Shabbos take out, when you're in a pinch, or even if you're not. There are a lot of great bakeries in Israel. For mizrahi style, your best bet is in the HaTiqwah Neighborhood in Tel-Aviv. HaMervad HaQsamim (above) also makes their own saluf bread. The best health/organic bakery is probably The Natural Choice (Belz) near Shuq Mahaneh Yehudah in Jerusalem. The best "I can't believe they're not milkhig," gooey, chocolate, chocolate chip cookie in Israel is only one of the treats you will find at Habah (Agudas Yisroel), in Mahaneh Yehudah on Yaffo St. Both their separated, parve and dairy bakeries are worth a taste. For the best "I can't believe they're not milkhig," fancy-shmancy items, go to the Belgian Bakery on KKL in the Sha'arei Hesed neighborhood of Jerusalem. Sorry to be stereotypical, but the Belgians really DO know their chocolate! Last, but definitely not least, everyone always wants to know where the best Fallafel is in all of Israel. I have actually heard many claim that the best fallafel in Israel can be found in Qiriyath Shmemonah on the Lebanese border. I was only there once, and did not have fallafel, so I cannot say myself. What I have heard is that "green fallafel" is found more often in the north and in Lebanon, than down here in the center of the country, the are with which I am most familiar. "Green Fallafel," obtaining its green color and distinctive flavor from the extra parsley and coriander leaf (cilantro in Spanish and in the SW USA), is my favorite. The best green fallafel I have found is at Arba Ta'amim (Four Flavors) in B'nei Braq (Nahalath Yitzhaq* & B'nei Braq Rabbanut), with additional branches in Tel-Aviv. The other three flavors available are spicy, sesame seed, and regular. Although I have eaten a great deal of fallafel in my life, I still do not consider my a conosuer. Fallafel King (Jerusalem Rabbanut - Mehadrin) on King George St. in Jerusalem, with its all-you-can-eat salads is not bad. But, I do look forward to YOUR recommendations! Not mentioned here are the best ice cream in Israel, the best seafood in Israel, etc. Please let me know. The best coffee house in Israel probably deserves its own post. I'm always interested in new places in Israel to try. Don't forget to leave your opinions in the comments to this post, and a link to your posts if possible. *I must note that many are concerned with the validity of the Nahalath Yitzhaq Kashruth certification. I will simply state here that one may want to investigate establishments on a case by case basis. The certification is legitimate, but the manner in which the certification was procured may not be. The post-Haggim edition of Haveil Havalim is now up on Soccer Dad's blog. Last year, I was in the Me'ah Sha'arim neighborhood of Jerusalem during much of the Fall haggim. The Seventh Month (Tishrei) coincided with the Muslim month of Ramadan, during which Muslims fast during daylight hours. A cannon fired in the evening indicates the time when it is permissible for them to eat. That year, I clearly recall hearing a second cannon fired a good 45 minutes to an hour after the first. I asked my friend if he knew what the second cannon was for. But, then I realized was it for on my own. The second fired much later after sunset were for the Muslims who hold by Rabbenu Tam. Rabbenu Tam is well-known for many of his rulings on Jewish Law, including his stringent ruling regarding when Shabbath ends.